With a zipper pocket inside and a zipper pocket outside. Fashion candy colour design, perfect for men, women and teenagers. Ideal for school, outdoor sport, hiking and travel. Made of high quality canvas and nylon material. The Main Pocket closured by zipper. Size: 45 (Height) x 29 (Width) x 10 (Thickness) cm, please allow slighty size difference due to measure method. Handle: about 9cm. Back straps: about 94cm, adjustable. 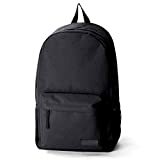 This entry was posted in Luggage and tagged Backpack, Black, Canvas, Colour, GSPStyle, Nylon, Rucksack, School, travel, Unisex by Perfect Vacation. Bookmark the permalink.